How would you say that your perspective has changed about selling your own work with multiple novels under your belt? It’s funny because my immediate reaction was to assume that I was more relaxed but that isn’t the case. When Dawnthief was published there was massive excitement and plenty of hope. Ten books later, I have a little less excitement and a whole lot more expectation. I have developed a fairly accurate gut feel about how well a book will do as well. That’s both a blessing and a curse, I find. 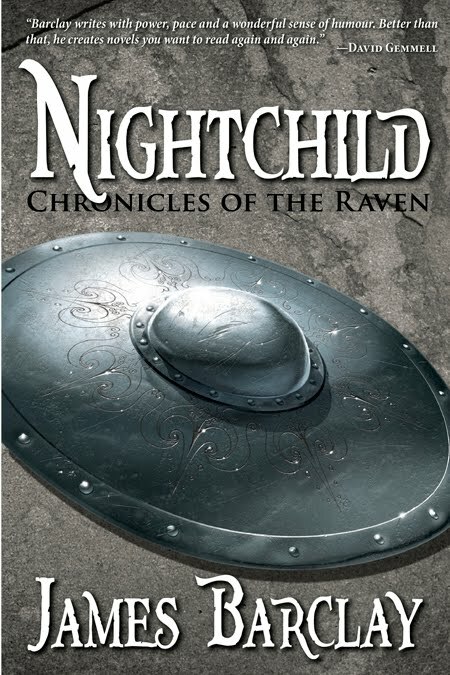 With Chronicles of the Raven (Dawnthief (Canada, USA, Europe, Noonshade (Canada, USA, Europe), and Nightchild (Canada, USA, Europe)) now published in the USA by Pyr, you might hear more and more about James Barclay. . .
And ideas are abound in the virtual world. I agree the internet has made the world a smaller place. Just to be able to connect with people half way around the world has made even a business structure more flexible. I can have employees that live on the other side of the world and still get a great product made because of the internet, online meetings etc. The next series though tough to get in. Hello Pat, we all love your blog :) I also have a fantasy book blog, do you wnat to swamp links? check out mine at www.reviewmyfantasy.blogspot.com and let me know if you agree, I will add your link to my blogroll.